​​​MRISAR's Interactive Traveling Exhibition; "Science & Tech"
A Hands-on Fantastic Adventure into the Realms of Science & Robotics! The exhibits are real technological devices and fully usable by the public. They are interactive to an extent never done before in a traveling exhibition. Adaptable to all ages and skills, the exhibition is a challenging experience that is both colorful and at times mystifying. Dare to test your skill in fun and educational ways! This is an exhibition designed to inspire and encourage a new generation of innovators and to provide useful scientific examples of electronics, robotics and engineering technologies. It features robotic elements based on our Award Winning and World Renowned work for NASA, for esteemed Universities, Research and Development, and Robotics Innovations. Each exhibit is designed to conform to STEM and higher education levels and to captivate with an expanse of wondrous environments and themes. Elements of technology and numerous parts in motion are fully visible to increase the educational merits. This is a complete rental show consisting of 27 (twenty-seven) world class hands-on interactive exhibits, 2 informational kiosks showing how the exhibition was created, 8 (eight) graphic panels and 1 (one) overhead Banner, suitable for 3,000 sq. absolute min. ft. to 5,000 sq. ft. max. Contact us for price and availability! 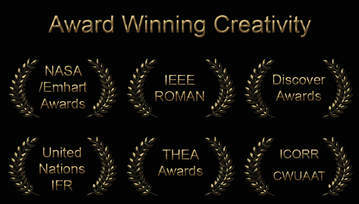 Featuring elements based on our Award Winning & World Renowned work.